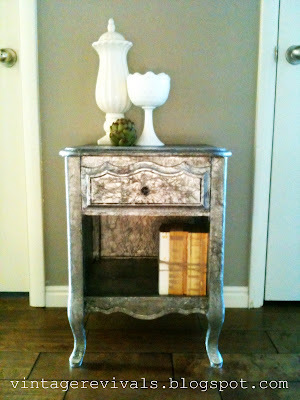 Endlessly Inspired: Would You Believe It's A DIY? Would You Believe It's A DIY? It is fun for me to look at blogs, artist websites, and decorating magazines for ideas of things I could make. Take a look at what these creative people have been up to. Again, I couldn't believe these are all homemade projects and neither will you. First off, this metallic inspired night stand on Vintage Revivals shows you how to create a much more affordable version of a popular design piece that can seen all over magazine and decorating shows. This tutorial shows you how to use tin foil and some paint techniques instead of emptying your wallet. 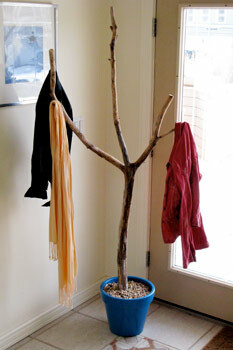 Finally, and I think my favourite, a do it yourself branch coat rack by DIY life. The tutorial is so helpful. I had thought of trying something like this a while ago, but learned that the process is more than just picking out a branch and sticking it in a pot if you want a sturdy, secure and long lasting piece. I love this idea so much, but unfortunately neither of our entrances have enough space for a coat rack...definitely a to-do project for when we move!! Personally though, I'd use something to cover the blue plastic bucket, maybe an aged terracotta pot, something a little more natural looking. Keep an eye out for an upcoming post talking about using branches to incorporate nature into your decor and welcome fall into your home. I love using DIY tutorials as jumping off points for new ideas. It's great to learn from others about tried and tested materials and techniques, then having a chance to modify to make it my own. Sometimes I'll have an idea in my head about things I want to make. I do a search to see if anyone else has tried it and knows how to tackle it. Other times I just stumble upon other's great ideas. My project to-do list is growing at an unbelievable rate, but time just doesn't permit right now. 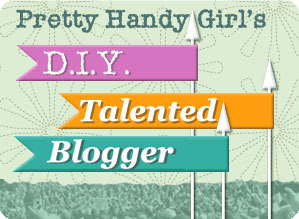 Do YOU have DIY ideas floating around in your head, but haven't yet found the time? How do YOU find time to take on DIYs?